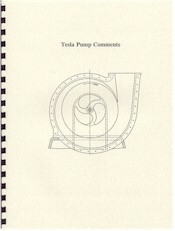 This 1994 paper describes the basic design of the Tesla disk pump and its principles of operation. Also provided is a comprehensive list of design considerations that will be of value to anyone wishing to build one of these devices. The parameters discussed include pressure/volume and horsepower, inlet to outlet ratio, and disk thickness, diameter and spacing, etc.